As a Work & Travel USA participant during the winter season, you'll have the unique opportunity to witness the "holiday season" in the U.S. Holidays are an important part of what defines culture, so experiencing holidays in another country is a great way to expand your cultural learning! In the United States, December is known as "The Holiday Season". In addition to Christmas, Hanukkah is widely celebrated throughout the country. This year, Hanukkah begins in the evening of Saturday, December 8th, and ends in the evening of December 16th. Also called The Festival of Lights, Hanukkah commemorates a great miracle that happened in Jerusalem during biblical times. The Holy Temple in Jerusalem was destroyed and needed extensive repairs. 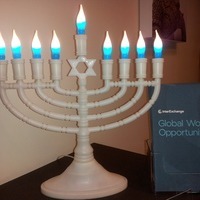 Oil was needed to light the "menorah" (candelabra) each night. However there was only enough oil to last them one night. Incredibly, the oil lasted 8 nights, lighting the temple for enough time to get more oil. Jewish people around the world now celebrate Hanukkah each year to remember this miracle. There are many traditions Jews practice during Hanukkah. Each family may have different ways of celebrating, but everyone lights the menorah each night of Hanukkah. We use special menorahs on Hanukkah called a "Hanukkiya". This menorah has 8 spots for candles, for each day of the holiday, and one "Shamash" or attendant candle that is used to light the others. Each night of the holiday you light one more candle so that on the last night all the candles are lit. Families gather in December to light the Hanukkiya and exchange presents to celebrate the holiday. Other traditions include making "latkas", potato pancakes cooked in oil, and playing dreidel. Dreidel is a spinning top game where you make different bets depending on which side of the dreidel you land on. You can do nothing, add to, take half, or take all of the pot. The winner at the end of the game traditionally is given "gelt" or chocolate coins as a prize.